The other day I was reading a personal story of a celebrity I am fond of, whose screen presence is always wonderful. She got into a controversy recently and had to struggle a bit to come out of it. In a public statement, she said, 'The windshield is always larger than the rear veiw mirror'. 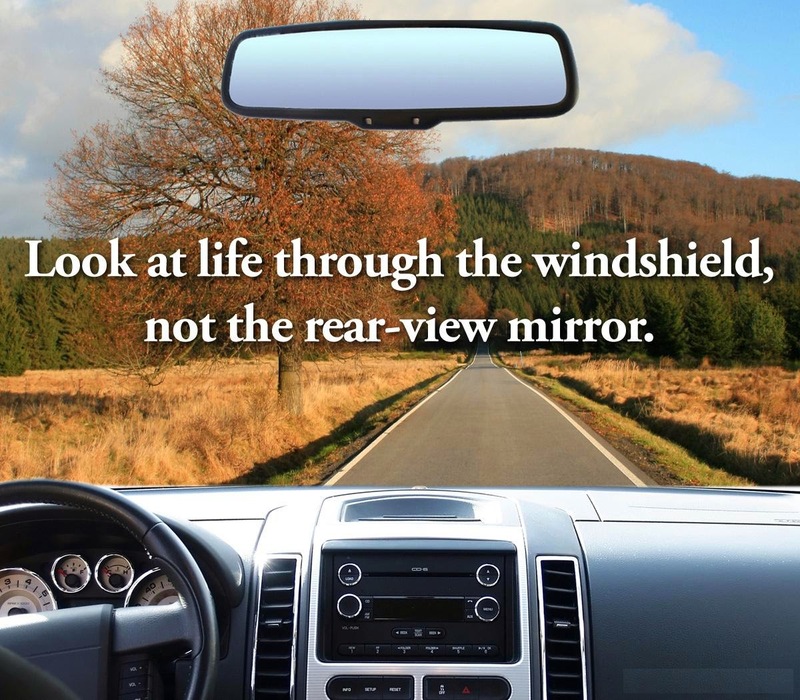 Are you more focused at life's windshield as you journey through life or is your focus fixed on the rear view mirror? How often have you caught yourself immersed in the pain, losses, suffering or disappointments of the past rather than focusing on the present and moving ahead with confidence and faith?. When we drive, don't we concentrate more on the large windshield looking at the big view in front of us and ahead of us? If we were to be lost looking into the rear view mirror, it's hard to keep our eyes on the road. When you glance back, don't be paralysed by any negative experience, because that only causes unnecessary misery and imprisons you in the past robbing you of joys and opportunities in the present and what's ahead of you. It disrupts your peace and sense of balance. You don't live there in your past any more. Time and again when we glance into our past, it should be to help us make better decisions in the present and for our life ahead. Our past has taught us the lessons we need to equip ourselves for this journey. And there will always be so much more to learn. It's an unending nature's process for our personal growth. Who we are and how we choose to travel our path is determined mostly by the choices we make today creating our experiences. So focus on your large windshield to make your personal journey a great one despite the challenges, hurdles and mistakes. Manouver confidently through the sudden curves, traffic jams, and not let the bad drivers ruin your journey. Tune into your internal GPS - guidance positioning system, as it will re-calculate and guide you if you get lost. Whenever you do glance at the rear view mirror, can you see all the beautiful and good things that have happened too?